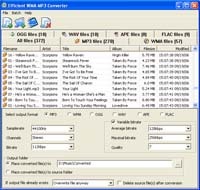 Efficient WMA MP3 Converter supports the most popular audio and video files formats as MP3, MP2, MP4, MPEG, WMA, WMV, OGG, APE, FLV, AVI, VOB, 3GP, FLAC, WAV, RealAudio, RealVideo, AAC, MOV, SWF, AC3, M4A, M4B,MPC, NUT and converts them into MP3, WMA, OGG Vorbis, MonkeysAudio (APE) or WAV format. The most modern and fast audio codecs are used in this converter, so you may compress your files with maximum quality. The program supports ID3 Tag v2. It gives you ability to transfer all of the most useful tag fields from source file. 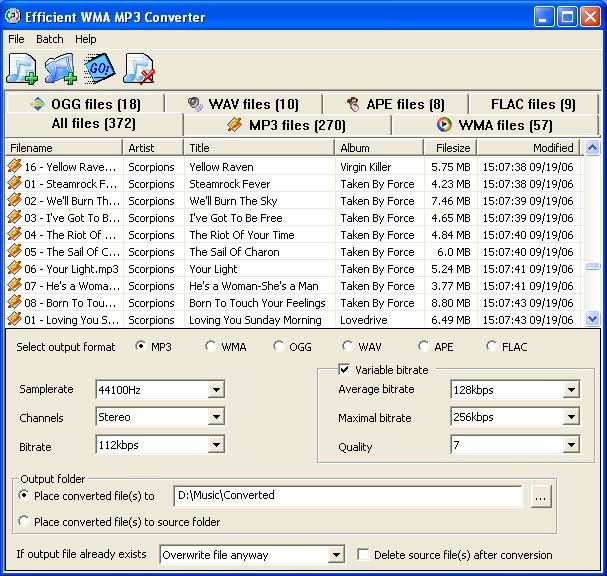 Efficient WMA MP3 Converter supports batch conversion mode. It makes (the process of conversion) the conversion of great amount of files all at once much easier. Just add files for conversion, choose an appropriate audio format and press Start. You can also add the whole folder of/with audio files (including all its subfolders). At the same time, you have an opportunity to choose which formats to add and which not. After adding, all the files in batch will be classified according to the format. Thus, you can convert all the files into one format at once or to convert each source type of files separately. All the necessary settings can be easily changed, as they are located in the main window. It makes the process of parameter setting easier, as you don't need to start lots of dialogs for setting. All the recent settings are memorized, so that in most cases you are only to choose the output format and start conversion. This software supports Drag&drop, so you can just add files from Windows Explorer. So, this program is an ideal way out for those who want to convert audio files in order to listen to them in mobiles and players and don't want to go through the hassle of settings.